“Despite a very common misconception, heart disease kills a higher percentage of women than men. Heart disease is the number one cause of death in women. 7 times more women die of heart disease than breast cancer. One of the reasons for this, is that in women, typical risk factors are particularly non-beneficial in predicting who is going to have a heart attack. 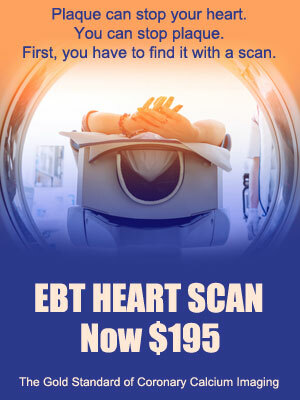 An EBT heart scan can change your future. Heart disease kills more women than all forms forms of cancer combined. 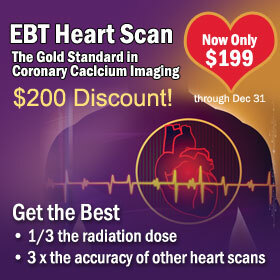 The EBT heart scan is the most effective toll we have at finding and measuring plaque in your coronary arteries. It can also determine if that plaque is growing or shrinking over time, allowing your doctors to adjust treatment accordingly without invasive procedures. If you are a woman over 50, Dr. Blanchet recommends an EBT heart scan. Should I Have a Heart Scan? “In my practice, I feel that any woman over the age of 50 should have an EBT heart scan because it is finding the disease that is more likely to kill them than all cancers combined. Heart disease kills 7 times more women than breast cancer. So, if we do an EBT heart scan on a woman age 50, and base treatment on the presence or absence of coronary disease, or plaque, we will do a dramatically better job of finding out who needs to be treated, and treat them appropriately. The next thing is to find out when someone has a positive calcium score is if we are treating their heart disease sufficiently to stop the disease. We find this out by doing a second EBT heart scan one year to three years later and compare it to the previous scan. If the calcium plaque burden is growing, then we know that we are not treating accurately to stop the disease and need to expand what we’re doing. As a result of my current practice using the calcium imaging, and treating it to the point that the calcium stops growing, I have seen a dramatic reduction in the instances of heart attacks, strokes and coronary disease in my practice. In fact, I have had no sudden heart attack deaths in my patients for over 8 years.